Shops : YES, The Auto Collections gift shop, Higuchi, The Signature Gift Shop, The Emporium Gift Shop,Gifts Plus, Fun Gifts, Whiskey Run. Address: 3535 S. Las Vegas Blvd. Restaurants : Fireside, Ming, Emperor's Buffet, Teahouse Coffee Shop, Embers, Betty's Diner, Cockeyed Clam. 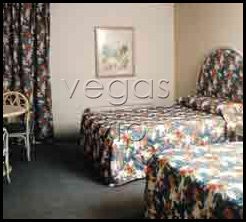 Standard room amenities : Cable TV, PPV movies, electronic door locks, hair dryer, AC, iron and ironing board, video games, radio, refrigerator. Hotel amenities : laundry service, luggage service, maid service, currency exchange, safety deposit boxes, arcade, hair salon, Wi-Fi, internet kiosks and Budget Rental Car desk. 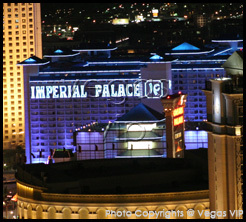 Centrally located on the Strip, the Imperial Palace offers fun shows and attractions, tempting restaurants and affordable rooms. In the casino, Dealertainers are dressed as celebrities while they deal your cards. Guests might even catch a quick, free concert on the casino floor ・if they池e lucky. The imperial Palace also offers several restaurants and a gigantic buffet in case of extreme hunger. Also, the lounges are a lot of fun and tend to be very busy.